This report stems from a dedicated workshop on nanotechnology communication which reviewed best practices developed by EU projects on nanotechnology outreach and dialogue. Different recommendations are summed up in this publication,identifying priorities for outreach, dialogue and education activities. 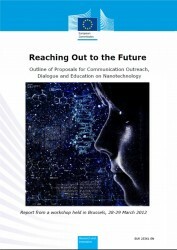 Reaching Out to the Future – Outline of Proposals for Communication Outreach, Dialogue and Education on Nanotechnology (pdf on ec.europa.eu, last accessed 18 Dec 2013).